Want your team to improve? This interactive builder helps leaders intentionally develop their team and build a plan for growth. Start building your training plan today! For some reason, hiring managers have a tendency to direct their employee’s career path to the dictates of the firm’s needs, and so the notion of developing a collaborative employee development plan often falls by the wayside as soon as the employee’s W-2’s and I-9’s have been filed away. This is a mistake. According to a 2013 Forbes Magazine article, “helping your employees shape the future direction of their careers is a critical component to your company’s overall success.” The failure to put together a professional development plan, for incoming employees, risks alienating tomorrow’s workforce, which is no longer wedded to the concept of lifelong employment with a single company. As proof of this fact, they demonstrate a marked proclivity towards following their own development plan, even if that means hopping from job to job in search of that fulfillment. Building Loyalty: when an employee feels as if they have “skin in the game,” they come to understand that the company’s success begets their own success. As such, devoting professional development resources to their success is an excellent way of building company loyalty. The Personal Touch: psychologists have long known that people respond well when someone takes a genuine interest in their future, so extending this fact of human nature to the boardroom helps string the bonds of loyalty between employee and employer. Employee Retention: talented people rarely like to sit idly by on their laurels without a meaningful opportunity to advance in their career. A staff development program ensures that that impulse is acted on in a way that benefits both the employee and the company. Face it, if we spent our entire day attempting to reinvent the wheel, we would have many oddly, shaped wheels, and wasted hours, under our belts by the time the workday has ended. That is why savvy managers and directors take the time to create a professional development plan template that guarantees that nothing falls between the cracks when it comes time to managing your employees’ careers. The time and effort, as well as the efficiency it promotes, saved makes a development plan template a must have in any manager’s toolkit. Luckily, for busy managers, when it comes to professional growth plan examples, the wheel has already been invented with a range of suitable development plan examples readily available for use in your company, including the one above. As such, taking employee development plan examples and harnessing them to your specific needs makes excellence business sense. An employee development plan template allows busy departments a ready resource when casting about for a workable professional development plan sample. An off-the-shelf development plan sample can help guide your employee career development efforts cost-effectively and efficiently. Developing a career plan for a new employee demands a long-range view to visualize where that employee’s career development goals will intersect with the company’s needs three, five, and even ten years down the line. Working with your employee on a career development plan therefore is an excellent way to bring about a sense of belonging for the employee, as well as serving as a way to map out a formula for long-term success with actionable goals that will lead to a realized career plan. Simply stated, career development is an informed, systematic way of working with your employees in such a way that your employee’s career goals and your company’s future goals are entwined. Career development theories have longed argued that instituting a career development plan template, for new employees, is an excellent vehicle for assuring new hires that your company’s investment in their effort is of a long-term nature. A collaborative career plan template is a powerful tool when used for employee retention and serves as a great career development plan example that every new hire can rely on as a benchmark to success. Career development begins on day one of a new person entering your workforce, and if you want to keep that employee happy, it is ongoing until the day that they retire. It is the role of the manager to guide their new employees in developing personal development goals. This personal development plan will help build the employee’s confidence, as well as adding value to the company, as they come to see their own role in the company defined and shaped through personal development plan examples that give meaning to their daily activities. In formulating an individual development plan template for new hires, managers are wise to break down learning and development tasks into smaller increments that move beyond the mere personal development plan template into real world applications. As such, like any good teacher, the human resources manager must use an individual development plan example to gauge the employee’s level of competence before adding another element of responsibility to their plate. As individuals master the components of an individual development plan sample, they build the confidence that they need with an understanding of where their efforts pay off in the company’s larger picture. Guiding this awareness, and building the careers of these employees at the same time is instrumental to a company’s long-term success. As the old adage says, “If you fail to plan, then you are planning to fail.” When it comes to establishing professional development goals, that failure is realized by not establishing benchmarks against which development goals can be measured. Examples of professional goals might include mastering the office software system within 90-days, or exceeding sales goals within a prescribed period. As such, don’t fail your new employees by failing to provide professional development goals examples that the employee can master before moving on to other professional goals examples to explore, master, and conquer. Career development plans are not just for new hires. Indeed, that initial development plan should be viewed as a living document that is subject to revisions and updates as the employee masters new skills and moves on to the next level of corporate responsibility. The same is true of those company managers who are doing the training. It does not matter if an employee is making six dollars an hour or six figures a year, without ongoing goal setting objectives, it is easy to lose sight of why they go to the office every day, and that is why a leadership development plan is necessary to keep their heads in the game. A personal development leadership plan gives professional focus to your firm’s top echelon, while reaffirming to the remainder of your staff that there is always room for growth. Whether being guided by a leadership development plan template, or drawing up one’s own leadership development plan example, the effort will pay rich dividends in a focused workforce. 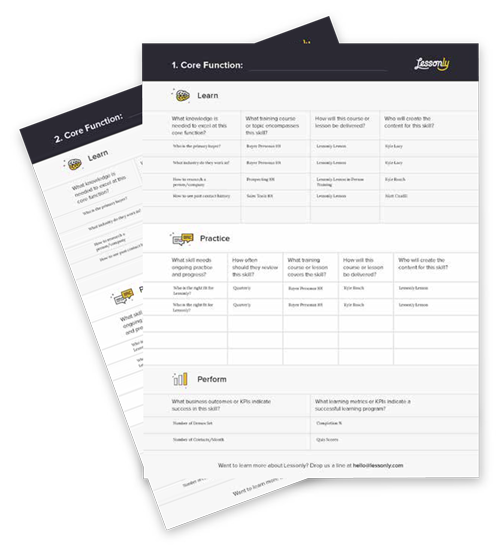 If your employee training is lacking or non-existent, our training plan template is a separate resource to help get you started. A strong training program is the first critical step in an employee’s development at your organization.